Leptotes orchids are among so-called “famous orchids”. Their fame is not only in their beauty and popularity as decorative plants but also in their gastronomic use. 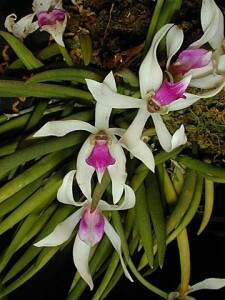 Yes, widely grown species – Leptotes bicolor – is used in Brazil as a Vanilla substitute. Its flowers and seed pods have Vanilla flavor and could be used just like Vanilla pods, in the same way and manner. 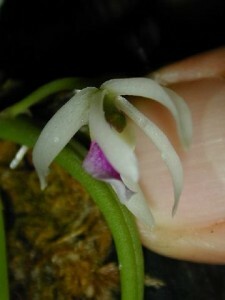 Given the fact that Vanilla orchid hardly blooms indoors, you can just grow Leptotes bicolor plant. Leptotes bicolor is easily bloomer, so you can enjoy the flavor of Vanilla and use it flowers in confectionery, tea, and others. Leptotes orchids belong to Laeliine subgroup and resemble Brassavola orchids. 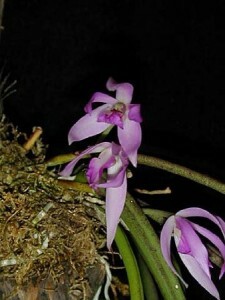 They are sympodial caespitose epiphytes which grow in drier regions, so their leaves are terete and succulent. Their native habitats are dry tropics of Brazil, Paraguay, and Argentina. They are miniature orchids with relatively big flowers – the type species Leptotes bicolor has fragrant 2 inch wide white flowers with purple lips. Leptotes unicolor – another widely grown species – has more short pseudobulbs and leaves, more compact growth habit and 1 inch wide fragrant flowers, which are pink. Leptotes tenuis is one of the smallest and prettiest of Leptotes species – it has greenish flowers with purple markings on lips. Leptotes orchids are relatively easy to grow if you meet their specific growth requirements. Given the fact that in nature they grow on branches in drier tropical forests, they do not need the substrate with high water capacity. In fact, they are perfectly suited for being mounted – preferably on tree fern, bark or epi-web. Air humidity should be high but air movement should be strong. Light levels should be higher than for Phalaenopsis orchids but without direct sunlight in midday – bright, filtered sunlight with some direct sunlight in the morning is good for Leptotes growing. Temperatures are cool to hot, so they are easily grown indoors and will tolerate a wide range of temperatures, but you should remember to decrease watering and humidity if a temperature is low. When actively growing (in spring and summer) they do need ample watering, higher temperatures, and some fertilizers. In fall and winter they have some dormancy and don’t grow – so you should reduce watering and do not apply fertilizers.